ELK FALLS, B.C. – They were supposed to last about 40 years. Instead, they lasted roughly 71 years. With their service now complete as of last fall, a trio of woodstave penstocks at Elk Falls north of Campbell River will begin to be removed this week. “They have always been of great interest to people either when driving over the Brewster Lake Road bridge or walking across them on the pedestrian crossing to the Elk Falls suspension bridge,” said BC Hydro spokesperson, Stephen Watson. Penstocks are pipes or long channels that carry water down from a hydroelectric reservoir to the turbines inside a power station. 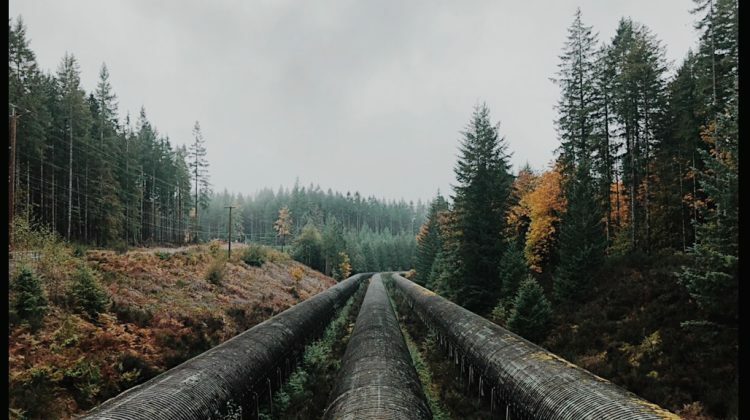 The local penstocks ­– which are 12 feet in diameter and 1.1 km long ­– were built out of old growth Douglas Fir and were made on the site. The first one was built in 1947, the second in ’49, and the final one was constructed a few years later while the John Hart facility was slowly built, as the surrounding community grew to take up the power generation. Over the years, until around the 1980s, the penstocks were sprayed with creosote to act as a wood preservative. They were in poor condition and were replaced last October by the new underground tunnel and powerhouse. “We’ve had a lot of feedback over the years that we should save a section for interpretive value,” said Watson. 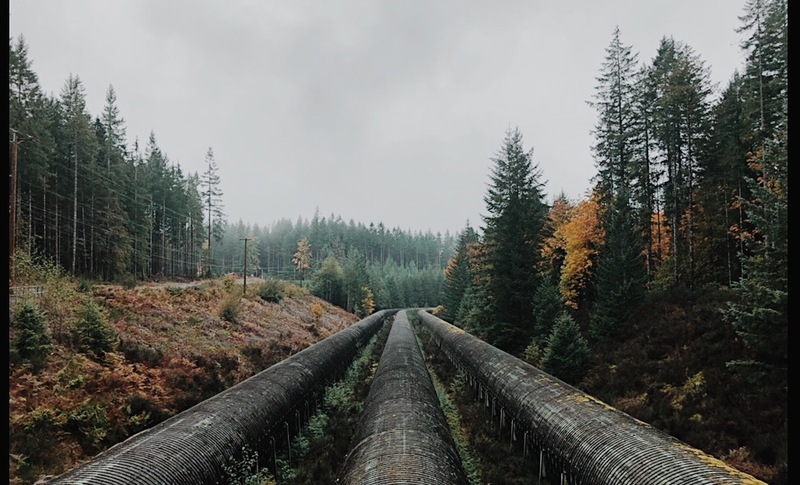 BC Hydro knows the history of the wooden penstocks and may have a replica made, perhaps three metres in length, by using Douglas Fir, the same design and dimensions, and with the original steel bands. The wood would then be painted with environmentally appropriate paint to give it a similar look to the real penstocks. That work, with BC Hydro likely seeking out assistance from a company or group within Campbell River, may happen in 2019. The location of the replica penstock for viewing is still to be determined. For the old penstocks, they will be removed over about three months. Soil beneath the penstock is also contaminated, on average around 15 centimeters deep, and will be removed this spring, so that the soils under the penstock corridor meet provincial Wildland Environmental Standards. The penstock corridor will then eventually be returned to a forest. The 600-700 metre-long steel penstocks are planned to be removed by summer 2019. Two of the three surge towers will be removed by next spring. One tower will stay as it has communications equipment and is a visual aid to the airport. The old generation station will be removed down to the ground level by summer 2019. There will be some closures to the Station View Trail/Canyon View Trail to complete this work. Advance notice will be communicated. By the end of summer next year, the Canyon View Trail through BC Hydro’s property will be returned to an area near the Campbell River, and the bypass trail that has been in place since 2014 during project construction will be decommissioned and closed off. InPower BC remains as BC Hydro’s contractor, with subcontractor FMI leading the decommissioning work.